According to early reports, U.S. and China agreed to put on hold new tariff increases. Following Buenos Aires, the White House said that, after a "highly successful meeting", Trump had agreed to leave tariffs on U.S. products at a 10% rate after January 1, while China agreed to buy a substantial amount of products from the U.S. The White House also said that China has agreed to start purchasing substantial U.S. agricultural, energy, industrial and other products from the U.S. to reduce the trade imbalance; and that the US and China agreed to try to reach an agreement on several trade issues "within the next 90 days." Last July, U.S. and China imposed 25% tariffs on $34 billion of the other's imports and levies on another $16 billion. In this $50 billion Muddling Through Scenario, the tariff’s economic impact would have been limited to 0.1% of Chinese GDP and 0.2% of U.S. GDP, respectively. In the Muddling Through Scenario, both full trade war and ‘America First’ prospects are avoided. A good start would be a bilateral tariff truce starting in early 2019. But it is predicated on successful bilateral diplomacy that will lead to positive prospects in the second half of 2019. 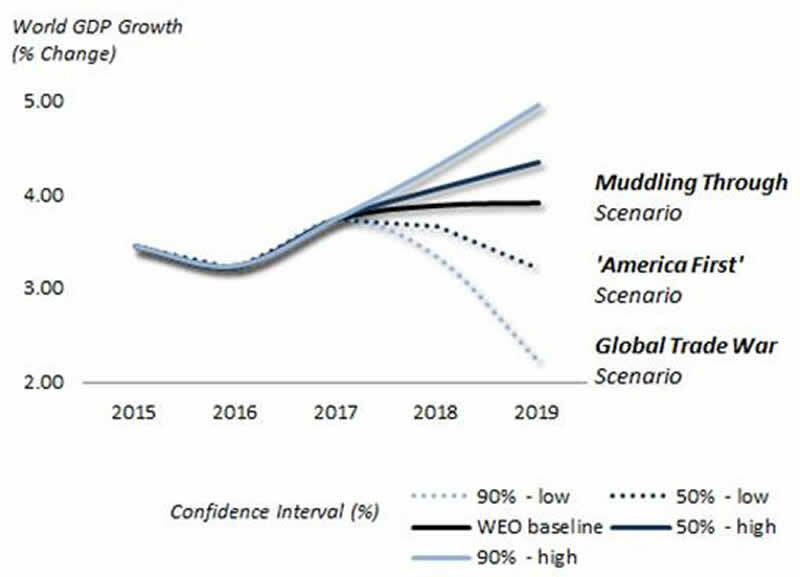 In this case, global growth prospects would remain close to the OECD/IMF baselines at around 3.5%-3.9% - possibly even higher.